It’s crazy to think that we’ve had two whole months with our baby girl already! And what better way to celebrate than by taking her to get her injections? I was completely dreading it and trying to prepare for the worst but it was much more emotional than I had even planned for! I am definitely glad that it’s over and done with and will be showering her with a ridiculous amount of kisses and cuddles for the next few days whilst we recover from the ordeal. I am so grateful that Paul had the day off work to come with us and he had the awful job of holding her whilst I stood watching trying to hold back my tears! I think I earned my bravery medal from Eve’s birth so I was definitely not emotionally ready to be too involved with her immunisations, maybe I’ll be brave enough next time? 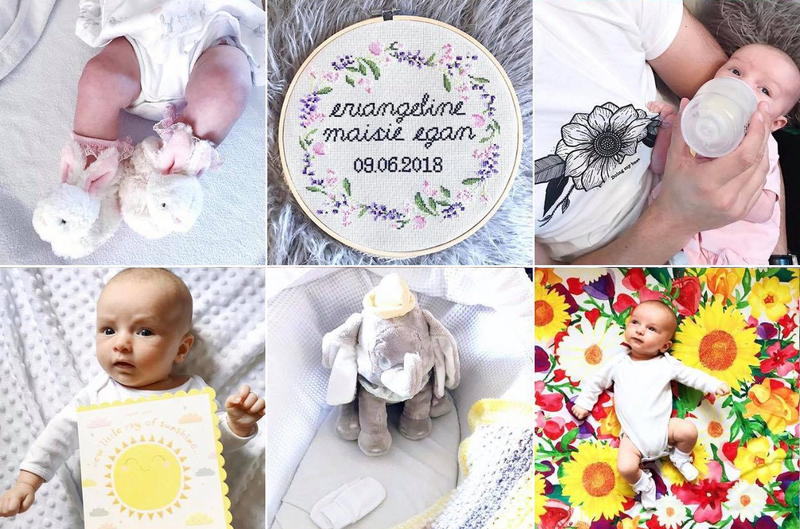 This month was an introduction to lots of new people and experiences for both Evangeline and myself. We survived the ordeal of the Build A Bear “Pay Your Age Day” which basically involved us saving £24, buying her a Jigglypuff the same size as her and trying our best to dodge the sea of angry Mothers and abandoned pushchairs. We also started our Daisy Foundation baby massage classes and I have loved learning lots of techniques and seeing her interact with other babies. I’m still not too sure how I’m feeling about Mum and baby groups as I become painfully shy in a room of people that I don’t know. I frustrate myself because I know once I start speaking to people I’ll be fine but I think my hormones are still all over the place which makes it a bit more of a struggle. I’m trying to persevere and will definitely be looking into more groups locally to me as I think it’s important to get out of the house with her and to interact with Mums who are in a similar position. Eve was sporting a very fancy hairstyle at the beginning of this month due to her hair falling out on either side. You’ll see as you scroll through the pictures that it’s been slowly filling in and she now finally has a hairline and not a forehead that extends to the back of her head! Her hair is so lovely and getting so long and thick at the back and her eyes have changed from a deep blue to more of an unusual grey which is so pretty! I always said that I’d love her to have my hair colour and Paul’s eye colour but I didn’t think it would have actually worked out that way. I’d love for her to inherit Pauls wavey curls instead of my boring straight locks but we will just have to wait and see! We were lucky enough to take her on another little holiday at 6 weeks old to Center Parcs in the Lake District. My Mum had booked for us all to go to as a family before I got pregnant so we had never imagined that by the time we were there it would be with a tiny human that we made! 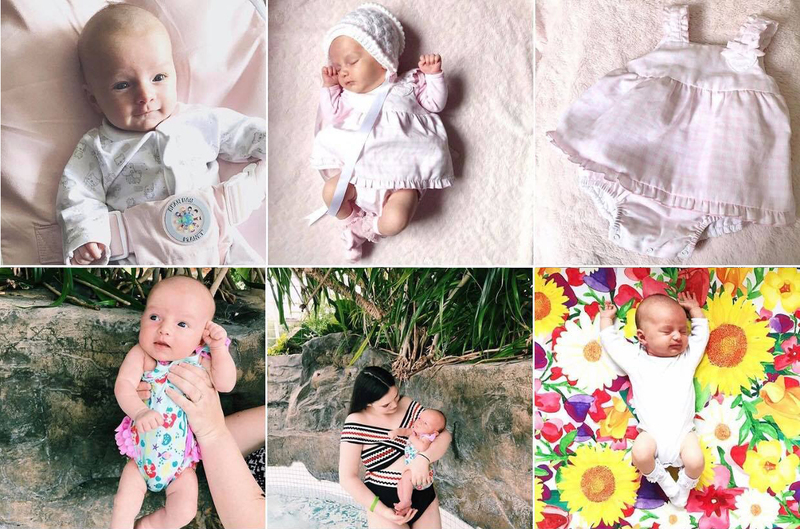 We had such a lovely five days and made so many amazing memories, we had a casting done of Evangeline’s tiny hand and foot and took her for her first swim! I think we were desperate just to see her in the frilly Disney swimming costume never mind actually take her into the water. She had started to fill out so her arm and leg rolls were too much for my heart and she got lots of attention from cooing women at the pool! The only downside from our swimming experience in such a big pool was the sniffly cold she ended up with, but it was nothing that a few recovery snuggly pyjama days couldn’t fix. At five weeks old we started to get some smiles and now at two months, she is absolutely beaming. Her gummy smiles and tiny giggles are honestly the best thing ever, even on the very worst days when she dishes them out after 20 minutes of screaming and crying for no apparent reason. And now our 6lb 15oz baby is 10lb 7oz and has finally made it into her Newborn clothes. I’ve no idea what clothes to save from her being so tiny but for the moment I’m storing them all in a box so I can make important decisions on what to keep at a later date. I’m thinking of making something with her clothes as a keepsake but I’m also frightened that if it goes wrong the clothes will be in pieces. A trial run or two will definitely have to happen before I touch anything with a pair of scissors or a machine! Our biggest challenge as a family this month was Paul returning to work after his paternity leave. Getting used to being at home just the two of us was overwhelming at first and it was equally as hard for him being away from us both. 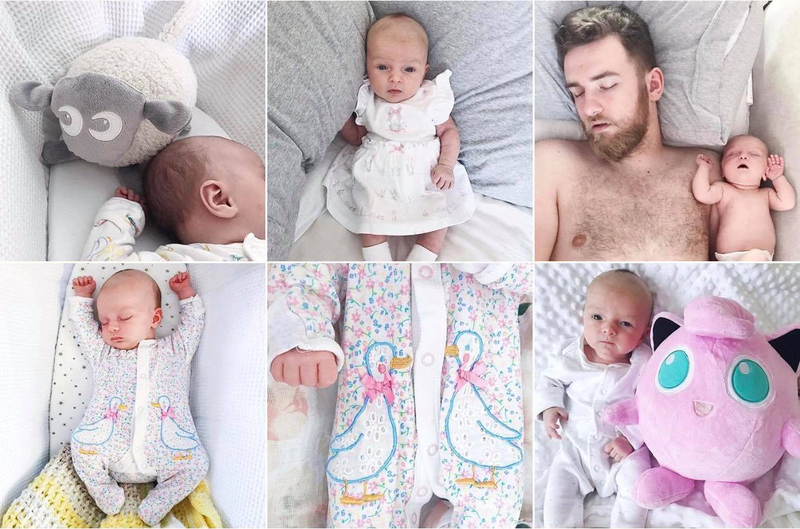 I spend a good portion of the day filling Pauls phone with pictures and videos so he’s not missing out, she changes and grows far too quickly so it’s good to have all of the memories on my phone to keep too! 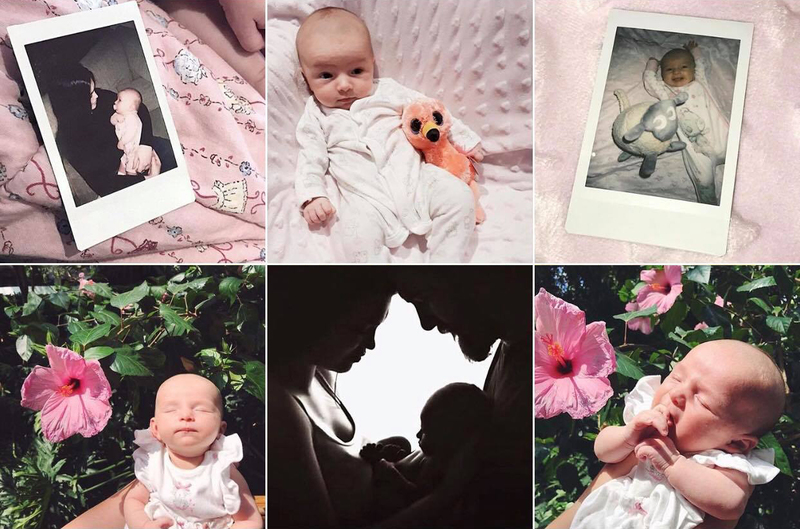 It definitely can feel daunting at times knowing that I’m completely in charge of keeping Evangeline content all day but I feel so lucky to be with her taking in every moment whilst she’s this small. One of my favourite things is definitely our cuddly mornings in bed when we usually go back to sleep, I can definitely see us hibernating and building big duvet dens when the weather starts to cool down. And that’s it for this months update, I’ve got lots more content planned but no set and stone dates for publishing due to finding the spare time to write my posts at the moment! 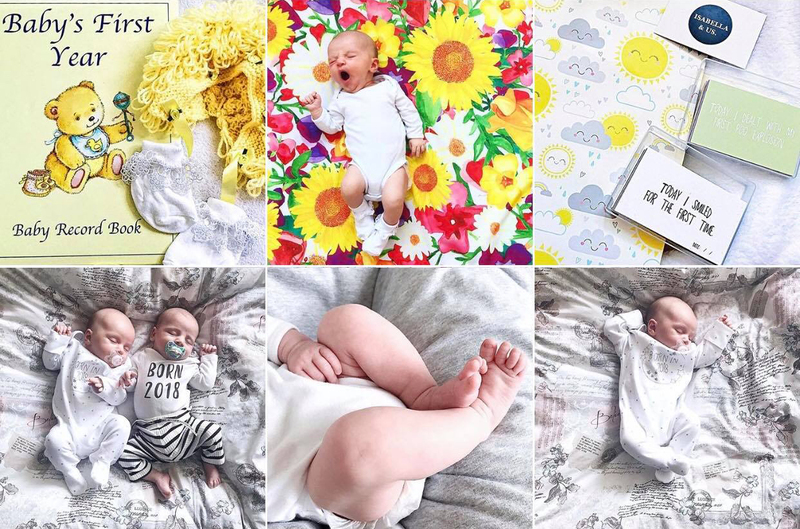 The next month for us is looking very exciting and we have lots of things planned including her first Wedding and Christening that I can’t wait to share. 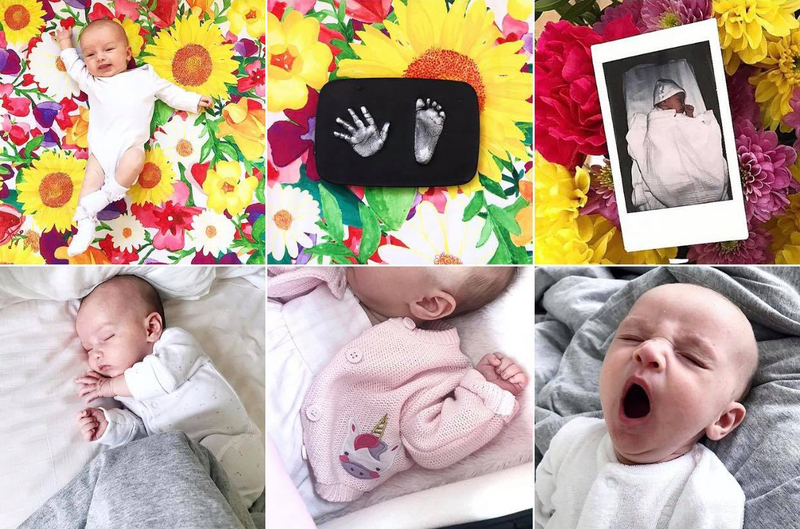 If you’ve enjoyed looking at the photographs then feel free to have a follow of Evangeline’s Instagram to keep up to date with our adventures and the cute baby spam. 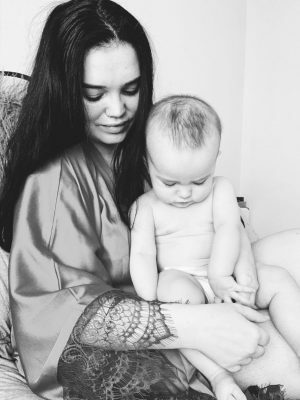 "HOW TO BOUNCE BACK AFTER YOUR PREGNANCY"